Promotional branded pens are one of the best promotional products we offer. They are a brilliant way to display your logo, slogan or company name in front of your target audience at all times, literally putting it in their hands. Our huge selection of promotional pens includes our best selling range as shown below as well leading brands like Bic, Parker, Cross and Papermate. Select from novelty pens to Eco-friendly options. 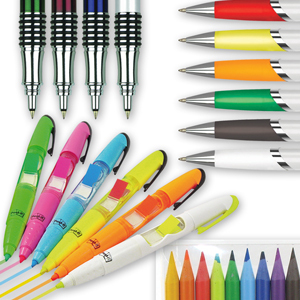 Branded pens offer great value for money whatever the size of your budget. One of the best budget retractable pens available in the world today. A substantial pen with a great print area. Trans parts give this pen a modern look. A top quality push action ball pen with a large capacity 'parker' style refill. Also a great print area to both barrel and clip. Ideal for those soft touch devices. A metallic modern looking soft stylus pen with a great print area to both barrel and clip. A top quality push action frost ball pen with a large capacity 'parker' style refill. A great print area to both barrel and clip. An outstanding value, twist action ball pen with vibrant frost colours and excellent writing quality. Also available as a solid white (Racer GT TPC600102). A curvy push action ball pen with a silver finish and coloured trim. A stunning looking retractable pen with a quality feel and available in metallic finish! White print not available on some metallic colours. A curvy push action ball pen with a huge choice of grip colours. Especially designed under license this stylish pen has excellent writing quality from a jumbo refill and a great print area to the barrel and clip. A low cost twist action pen with a great quality refill in vibrant colours and large barrel print area. A low cost twist action pen with a great quality refill and large barrel print area.